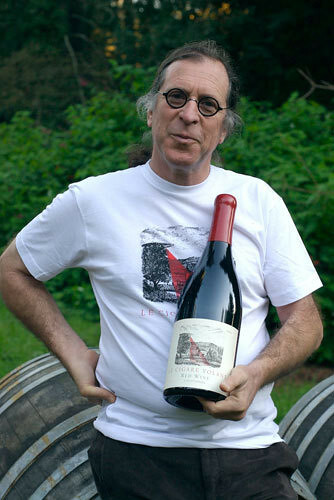 I’ve met Randall Grahm on several occasions, visited his winery in Santa Cruz, toured him around some biodynamic vineyards in Walla Walla, admired his early evangelism for Riesling, and tasted many vintages of his wines. I don’t believe I’ve ever enjoyed any of them as much as his current efforts, which seem to mark a new standard (to borrow a phrase from Steve Tyrell) for Grahm, for his winery, and in some respects, for all of the Central Coast. A few weeks ago Randall e-mailed me with a typically pun-soaked message. “We have been so busy chez Doon of late that we've not sent samples out in essentially a Counoise' age” he wrote, continuing ”but if it 'twere Doon, best that it be Doon soon. There are some incredibly compelling wines in this line-up, and most significantly there are a few – the Réserve wines, in particular – that really represent a significant advance in winemaking stylistics, demonstrating that Bonny Doon Vineyard continues to iterate and innovate at a pretty good clip. A short time later, a mix of wines arrived at my doorstep, and this week I finally had the opportunity to spend time with them. And what a time it was! No one crams more information onto a wine label than Randall, and you’ll want to settle into your most comfortable reading chair with a magnifying glass in hand before tackling the latest editions. But they are so much more edifying than any ordinary blather about passion and terrior (sic) and so forth. On a typical back label, say from the 2008 Le Cigare Volant “en demi muid”, there is an introduction about the banning of alien crafts, a mention of the cépage, a gently-stated suggestion to decant the wine “for the optimal tasting experience”, a word or several about non-intervention, and a call for transparency, leading to further details about contacting “the Mother ship” and a methodical listing of ingredients and other amendments used during the winemaking. By the time you get to the government’s standard advice not to drive heavy machinery if you are pregnant, it seems downright tame. All of this is more or less standard Bonny Doon/Randall Grahm, which is to say it is entertaining, obfuscatory, somewhat inscrutable and at times simply baffling. But behind it all are some really terrific wines, moderate to low in alcohol, detailed with mineral and a range of underblown fruits, biodynamically-farmed, and requiring almost as much study and concentration as the verbiage. Among those tasted were the 2011 Le Cigare Blanc Beeswax Vineyard (62% Grenache Blanc, 38% Roussanne). The alcohol is just 12.5%, and the flavors conjure up melon, pear, pineapple and grapefruit rind, with an undeniable suggestion of beeswax. $28. Le Cigare Blanc 2010 Réserve ‘En bonbonne’ is racked, following ML, to five gallon glass carboys, left sur lie, while what is called “anaerobic magnetic batonage” is done monthly. It’s a honeyed honey of a wine, not sweet, but luscious. $50. 2008 Le Cigare Volant ‘en foudre’ and 2008 Le Cigare Volant ‘en demi-muid’ are two takes on the familiar favorite. Randall writes that “the cellar treatment of Cigare Volant is always a mix of puncheons and large wood uprights in one proportion or another, dependent on vintage. I was curious to see the development of the individual components over time; so we reserved a portion of each component before the final blend. To many palates the ‘demi-muid’ would seem more normative, perhaps more in the International style, but for me, the ‘foudre’ is funkier, more soulful and ultimately the more appropriate interpretation for these meridional grapes. (But what do I know? )” $45. Well, actually, the man knows a whole lot. I can’t speak to meridional, but I recognize funky, and I did prefer the foudre slightly. There is also a very fine 2010 Syrah Le Pousseur, certainly the most elegant Central Coast Syrah in my experience ($26); along with a 2009 Syrah Bien Nacido X Block that somehow avoids the jammy, fruity excesses shown by so many wines from that massive vineyard. $42. All are screwcapped, of course, and every one of these wines was still drinking beautifully three days after first being opened.